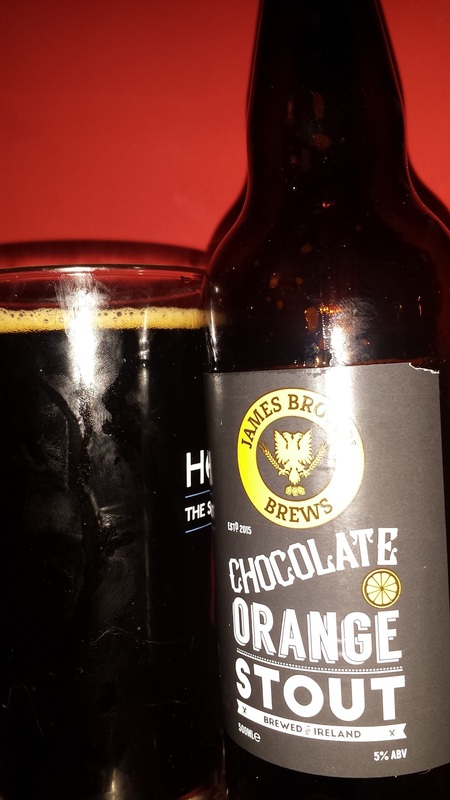 James Brown Brews is contract brand produced at the Brú brewery in Trim. It's produced by the young James Brown from a tried and tested homebrew recipe he developed. His first beer is a chocolate orange stout but don't let the name fool you, this is not a liquid version of a Terry's chocolate orange and perhaps that's a good thing. It was recently crowned the Beoir Champion Beer of Ireland after beating off over 80 other entries at the Killarney Beer Awards during the Killarney Beer Festival. 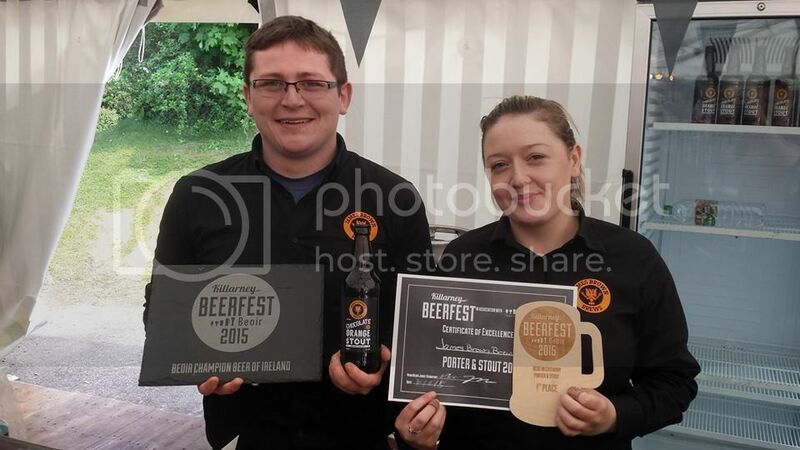 It also won a bronze medal at the Dublin Beer Cup in February. So how does this multi award winning beer taste? It tastes like how an excellent 5% ABV stout should taste. On the nose is chocolate and coffee with a little caramel. No orange though. On tasting, there's a bitter, burnt coffee bean hit and then it smooths a little with some vanilla. There's a long and lingering bitter finish with a mouth coating oily finish. No real orange appears but as I understand it, he's going for subtlety. You would miss it if it wasn't there but it's not the main thing about the beer. Personally, I would prefer it if the beer had a bigger body, as it's just a little on the thin side. That makes for easy drinking though which some people prefer. I would also like it if the orange was a little more pronounced, not too much, just enough that you don't question its existence. A great first beer and fantastic result for the young brewer. The next beer is to be a tart rhubarb IPA and that just sounds like it will be brilliant. With luck, he will be able to open his own brewery in the near future. 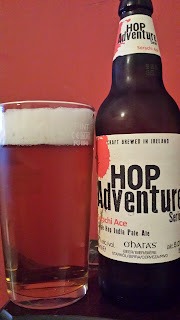 O'Hara's are releasing a new series of single hop beers called Hop Adventure so they sent me some to try. The first one is Sorachi Ace, a Japanese hop that is often described as being a little weird. In fact, the hop was developed in the 70s and quietly boxed away for being a bit too odd even for the 70s! I would have thought it would fit right in. Sorachi Ace hops are known for herbal and lemon flavours and aromas and that's exactly what it brings to the first Hop Adventure. A big lemon hit followed by what I can only describe as some sort of lavender perfume. For me, the perfume overpowers and I don't enjoy it. My wife on the other hand loves it. Single hop beers are often hit and miss. There's a reason why most beers use a blend of hops to compliment each other. Some hop strains can be a little too in your face on their own. Citra and Sorachi Ace are two prime examples of hops that are best mixed with something else. That said, I do love single hop beers as a showcase for hops. In some ways, this is better than the Brewdog IPA is dead series because they are keeping the ABV at 5% which means you get all the hop characteristics and none of the big malt body from a 7+ % beer. I'm looking forward to seeing what they do with the next release. Mosaic would be a good one I think. +1 for Mosaic! Is there a poll somewhere? Get on up James Brown, delighted for him!! Double Simcoe is something a couple of customers have mentioned!